Fortunately, it can be very simple to learn the difference between towing capacity and payload. This does not involve having to memorize any big words or jargon. In fact, the difference is simple. The payload is something you carry inside of your vehicle. 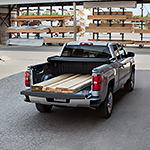 Towing capacity involves pulling something that is behind the vehicle. Another thing to consider is that the weight is not directly on the truck. For more information on towing and payload, call us or visit us at Cox Auto Group.